People far and wide have been asking about Little Lady Lickit. Does she retain the truth of her title? Has she proven herself worthy of her royalty? Upon investigation, it has been certified that Little Lady Lickit has lived up to her name. Furthermore, once crowned Queen Lickit (at least seventeen years hence), she will demand a new title. She requests her subjects not refer to her as "Your Highness", but, instead, "Your Lickness." Please take note of this future change. Bucky came to our family in 2003. We treated him well, even when he started to show signs of old age. We gave him baths and tended his every wound. Though his body started to fall apart, we still gave him all the love and care we could. He had given us many memories, and for that we were grateful. We were so good to Bucky. Until we sold him. You see, we're not as nice as the story sounds. This baby's name? Toyota Sienna. This one's a girl. We'll just call her Sienna. Sienna is nothing fancy; she's just perfect for our family. There are seriously so many things we love about her. But most importantly? Megan loves her. Plus, Sienna will be able to carry all those Foster Kids we hope to have in the near future. I'm pretty much in love with this van... I mean, Sienna. She's just full of tricks everywhere and fits us like a charm. Plus, I'm totally convinced that we got her for a steal of a deal. I'm one happy momma. Oh, and now we're apparently cool, too. Have you seen these videos? People with Siennas pretty much rock. And now we've got our own Swagger Wagon. Go us. Ride on, Sienna. Ride on. So, I was complaining to my awesome sis-in-law, Jenny, about how Megan never smiles for the camera. Jenny told me that when she had that problem, she just said "HAPPY!!" as enthusiastically as she could, and then the smiles would come a-flowing. It's easy to catch her happy while she's eating. Duh... who's not happy while they're eating? This one really cracks me up because she looks like a little alien (she pulled out her little hair do thingies) and she doesn't actually look happy, but she's laughing like crazy. We love our silly, happy baby. Love her so much. Today while I was doing Megan's hair for the coming week, I decided to get a bit brave. I've done little puffs in every way I can think of, and I'm getting kind of bored with it. I got Megan's new 'do from something I saw on another baby's head. The mom kinda told me how to do it, but Megan's didn't turn out as well. But, that's okay. I'm just learning, and Megan doesn't know if her hair looks great or looks horrible. So, this 'do is growing on me, but I still look at it and think it's kinda weird. It took me more than twice as long as usual, and I'm curious to see if Megan pulls it out before the week's through. 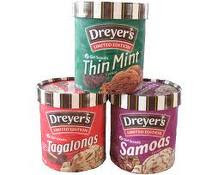 During Girl Scout cookie season I treat my family to a yummy carton of Samoas Dreyer's Ice Cream (Edy's Ice Cream to those of you in the East). In one word: YUM. A couple years ago I noticed that Dreyer's changed their ice cream sizes. Where you used to receive 2 quarts, they packaged 1.75 quarts for the same price. Then, tonight at the grocery store when I picked up my long-awaited-for ice cream flavor, I noticed that the cylinder was now smaller and only contained 1.5 quarts. And, again, for the same price. Needless to say, I slapped that puppy right back into the store freezer and bought something else. Now is when I say "WHAT THE HECK" for two different reasons which infuriate me. #1: Do they think we (their customers) are stupid? Honestly, do they think we won't notice that the ice cream container keeps getting smaller and smaller? Do they think that we don't read the volume printed on the foods we buy? Do they think we will still buy it? I know that I won't. I'm done with Dreyer's. Not only is this offensive to me, but also it makes me lose all respect for the company. Yes, I know we are in a recession, and I know that all companies need to cut costs. But, Dreyer's/Edy's... why must you insult me? I would respect you much more if you just hiked up your prices like everyone else. It makes me upset that, instead of being honest about it, you insist on trying to trick us all. Shame on you, and "WHAT THE HECK!" #2: I looked the situation up on Wikipedia and apparently these ice cream changes were not so recently made. In fact, the change from 2 quarts down to 1.75 quarts was done back in 2002! Why, then, did I only notice the downsize a couple years ago? (and, no, it's not because I'm stupid... I noticed right away and it aggrivated me). I have to wonder if the ice cream I received in 2008 was really made before 2002???? Does ice cream sit around for 7 years before it makes it to the store shelf? And, then again, I just noticed tonight the change from 1.75 quarts down to 1.5 quarts, and that change happened 2 1/2 years ago! "WHAT THE HECK!" If you can't tell, I'm a little worked up about this. From now on I'm buying other ice cream. Dreyer's/Edy's: you no longer have my loyalty. Yes, I do think you have a good product, and I especially like your lower-fat options, but you have betrayed me! I do not like products who betray me. Our relationship is over. Too bad for you, because I like ice cream. In case you were wondering, we didn't win that $25,000. Darn. Megan's favorite thing lately is putting on "bling" and walking around Nana & Papa's house. I've been trying to find her some for our house, but no luck yet. I think I need to try the dollar store. Megan got to play with cousin Kienan for a while. Their favorite thing to do is to fight over toys. I don't know if Megan is happy or mad in this picture. Let's just say happy. And here, we tell them to kiss and they do.